ModernLifeBlogs Tips Choosing The Best Cable Railing – What To Keep In Mind? Nisha Pandey · @nishapandey510 · Feb 1st, 2019 · Comments Off on Choosing The Best Cable Railing – What To Keep In Mind? A cable railing is one of the commonly used construction materials. As a matter of fact, it is one of the favourites when it comes to railing the patio or deck. If you are going to search online, you will find a variety of cable railing system. To narrow down your choice, there are a few things you need to keep in mind. Not all cables for railing are created equal. Some are of high-quality while others are substandard. Which is why it is important to thoroughly check the quality of material and purchase only from a highly reputable seller. If you hire the service of experts in cable railing, you will need to pay more but you will surely get your money’s worth. Do not hesitate to ask relevant questions such as the portfolio and previous clients. If you want to save some money, especially on the labor cost, then it is best if you have some DIY skill. That way, you can assemble the railing by yourself. A cable material is one of the best materials to use for railings, be it inside or outside your home. It is elegant and at the same time modern. It is also perfect for people who want to build a minimalist design and unobstructed view of beautiful things surrounding you. It is highly functional and sturdy. A railing should be sturdy and for it to be sturdy, it needs to be made from a highly durable material. Cable is both strong and durable. It is resistant to rust and corrosion. It is worth your investment as it will certainly last for the years to come. A cable material is cost-effective. It is easy to maintain and upkeep. The initial price of purchasing cable may cost more than other materials, but you will save money from it in the long run. A cable material is aesthetically appealing. You can cut and design it to whatever you please. You can install the railing inside and outside your home. You can put it in the balcony, staircase, patio, deck, and other places you wish to. A railing made from cable adds a level of security and protection. It protects the people from accident as it serves as a barricade without compromising the aesthetic component. 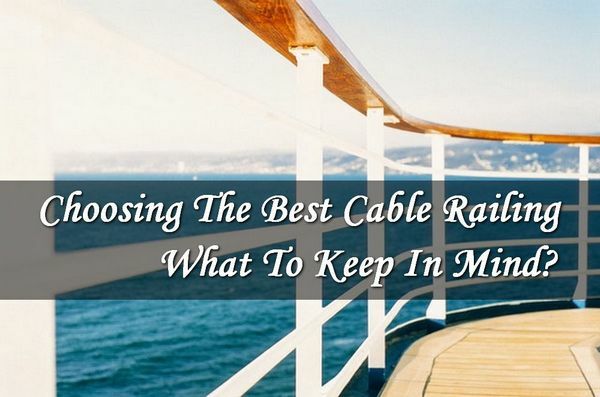 Should you go for a cable railing? The answer is a big YES! It is something that every homeowner should consider. It may cost more initially but it is a wise investment as it is highly durable and will sure to last for the years to come. If you want to find out more about railing system, then you should not hesitate to check out available resources online.